Gail doesn’t! She works from photos that you provide. How do I pick just one? That sometimes is the hard part, especially if your dog is photogenic. Gail’s Bella always avoids the camera, while Bogart is a ham. If you have several that you are having a problem deciding on which to chose, just send them all when you order. Gail will help you winnow down to the best 2-3. 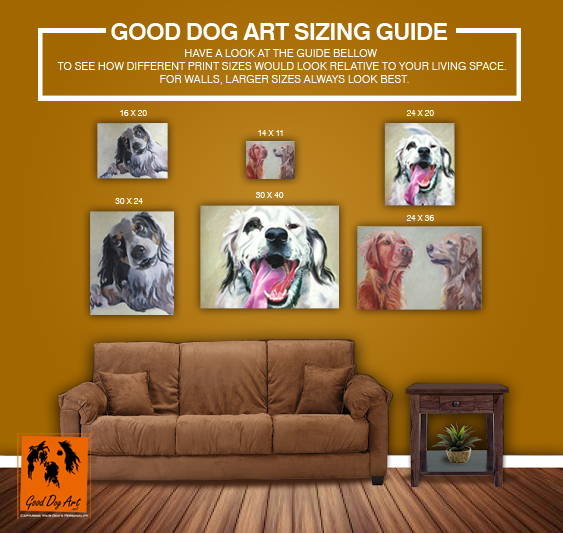 She will be looking for the best composition along with the reference you provide on the personality of your pet. Both are a part of a good painting. What if I only have one picture? If you only have one, Gail will work with that image. She have worked from one frame of a video tape since that was the image the client loved of their best friend. How do I get a good image? Check out the tips on taking photos (CLICK HERE). Ask a friend to help you with treats and toys. And take lots of photos. Gail has taken 50 photos to get 1 good image. How long does it take to paint my pet? Usually two weeks from the time you make a decision on the image you love and Gail receives your deposit. Please note that during the holiday season Gail is very busy, so project start date depends on orders in queue. What if I want to give this as a gift but don't know what is the best picture? The best solution for this situation is to purchase a gift certificate. They are good for 1 year from purchase. And the recipient has a pleasure of going through their photos to pick the one they would like. Gail works with many pet non-profit charities which are gift certificate so she knows that people appreciate getting to have input.